Developer Joe Sitt sure seems truly certain that the Bloomberg administration has a pot of gold for him at the end of a rezoning rainbow if he totally annihilates Coney Island. 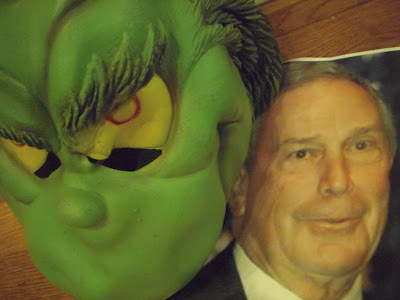 We refer you to Rich Calder’s Christmas Day New York Post Story, The Grinch Who Stole Coney Is. : Christmas Eve Lockout. It sounds as if Mr. Sitt is hacking away machete-style to destroy every inch of Coney Island amusement area he can colorably claim he has the right to through his unfortunate ownership. It doesn’t make sense for him to be destroying the zoning compliant amusement uses of these areas unless he is confident that the Bloomberg administration will accommodate him (or those who subsequently purchase from him which is the likely plan) with a coup de grace rezoning once the dastardly deed is done. And once destroyed will anything replace our Coney? It is a bad economy. That which gets destroyed does not necessarily get replaced. How many areas of the city that resiliently survived for generations through good times and bad must be destroyed under Bloomberg to be replaced, if at all, perhaps only decades hence? We’ve seen the destruction of thriving parts of Prospect Heights including the landmark Ward Bakery. It might be replaced in 30 years. Columbia University has been given the tool of eminent domain to blight West Harlem and hold it for slow development over decades. Willets Point is may also be wiped out with eminent domain and again, who knows if it will be replaced in 30 years. Keep alert. If you go to Coney Island this New Year's Day the Polar Bear Club will be taking their annual swim. Expect also to see people who are gathering because they don’t want Coney Island’s future taken away from us. It seems as if plans are taking shape. They should be gathering at the gates of Astroland, another amusement calculatedly put asunder by Mr. Sitt. Go. Go to Coney Island this New Year's Day. You even have an excuse: Coney this year it is Reuter’s top pick of all the places in the world to usher in the New Year. See: Travel Picks: Top 10 places to usher in the New Year, Fri Dec 26, 2008. Maybe Reverend Billy will be there and maybe the Whos will be making a joyous sound the Grinch will hear from his mountaintop. Forest City Ratner never bid to become the developer of Atlantic Yards. Giving a decades-long monopoly on acre upon acres of Brooklyn development to a bankrupt developer with bankrupt ideas who is forever looking for opportunities to raid the public till for additional subsidy is hardly the model we should be following. Forest City Ratner is the same developer who has the twisted notion that its ravaging of Prospect Heights and its environs with blight will strengthen its tenuous chances of being permitted to develop the area. Obviously, Forest City Ratner will be generating more blight until it is extracted out of the picture. Governor Paterson, Mayor Bloomberg or even the City Council each have the independent ability to initiate the action of extracting Forest City Ratner from the picture. Let’s consider how they are going to do it. Consider this a wiki-piece. We are throwing out ideas in the list below that consists of various thoughts about ways to terminate Ratner’s “entitlements.” We invite anyone to contribute additional ideas to the list. How good an idea does one need to send Ratner and his “entitlements” packing? It probably won’t take much to bid adieu to Forest City Ratner. Remember that even were Ratner to protest, the courts are going to be sympathetic to the government seeking to follow a good government course of action. 1. Entitlements? Where would they come from? There was no contract to begin with. There is no such thing as a legally enforceable "agreement to agree." A contract has to be reasonably specific from both ends about what is going to be done in order to be enforceable. 2. Next, the project is no longer what was approved. For instance, there should be no obligation to do a $950 million arena when what was approved was a $637.2 million arena. 3. It is easy to simply note that more approvals are needed and that they won't be forthcoming. An example: the Public Authorities Control Board approval taking the arena up to $950 million. 4. Housing subsidies should not be given unless there is a competitive bid for the parcels of project being financed. That knocks Ratner totally out of the box. The housing agencies have not contracted to give (non-bidding) Ratner subsidy and they shouldn’t. 5. Then there are the various breaches on Ratner's part. 6. It is also possible to throw Ratner out based on misrepresentations. 9. Ratner’s so-called “entitlements” can be voided for public policy reasons. 10. Eminent domain could be used to wipe out whatever “rights” Ratner thinks he has. 11. Then there is the simple expedient of just settling the law suits- Why? Because the state knows that there is plenty in its files which would cause the litigation to be lost if it is divulged. 12. Because of various bait and switches, what was contracted for was never properly approved. There are therefore no valid “contracts” because they would all be ultra virus. An ultra vires defense can also be asserted to the extent that authorizing legislation has been exceeded. 13. Recind city and state appropriations. Take advantage of the fact that this project is being done over the course of so many years that appropriations for it can always be recaptured because the City Council and/or the state legislature this year doesn’t have to spend what once upon a time a prior City Council and/or the state legislature decided it wanted to spend. The above is not intended to be inclusive. Nor have we ordered ideas, putting the best first. Pretty much any one idea would suffice in itself though there is always the option of using ideas in combination. As we said, consider this a wiki-endeavor, so we are soliciting additions. The way the meeting should have concluded is that ESDC Chairwoman Marisa Lago should have asked the Forest City Ratner people to leave the room and she should have thereupon addressed the assembled legislators to say, “Here are our favored options for terminating our relationship with Forest City Ratner.” If this did not happen, upon Marisa Lago’s initiative, the request for the Forest City Ratner representatives to leave the room should then have come from the legislators present. Our legislators should have then asked Ms. Lago to present the termination options. If neither of the above happened, each of the legislators involved in the meeting should be contacting Ms. Lago in follow-up, asking for a detailing of the preferred termination options. All it takes to get moving is for people to decide that pulling the plug on Atlantic Yards is what we are going to do and for the government lawyers to get creative because this is the time we are going to do it. We are happy to add additions from the government lawyers to our wiki-list. We understand that the legislators who were involved with Monday’s meeting and should be equipped with the identified option to terminate Forest City Ratner are as follows: City Council member (and candidate for City Comptroller) David Yassky, City Council member (and candidate for Public Advocate) Bill deBlasio who sent a represntative, City Council member Tish James, Congresswoman Yvette D. Clarke, New York State Senator Velmanette Montgomery, New York State Assembly members James (Jim) F. Brennan, Joan L. Millman, and Hakeem Jeffries. Let’s see what they can send in to add to our wiki-list. We are going to start this piece by saying a few appreciative things about New York magazine and the proceed with a segue to discuss what will be necessary for us to say appreciative things about our New York politicians. They say New York is the place where your greatest dreams can come true. Of course, it’s also a place where those dreams can die on the vine. Take Atlantic Yards. Lending new meaning to the term noncontextual, Bruce Ratner’s $4.2 billion, 22-acre combination of residential towers and office buildings, anchored by a basketball arena for the Nets, was supposed to completely transform downtown Brooklyn—with seemingly little thought given to what it might do to the already paralyzed intersection of Atlantic and Flatbush Avenues.
. . . Ratner has reportedly laid off workers, and he’s admitted he won’t build anything other than the arena without an anchor tenant for the tallest building. Five years ago, Gehry said what he really wanted was the chance “to build a neighborhood from scratch in an urban setting.” At the moment, the old neighborhood is winning. Score two points for entropy. Pursuing all the 59 reasons to love New York, this was the only one we could spot that was based on something that is NOT happening. Maybe the closest to it is reason number 3, which is that New York is taking back its streets for pedestrian use. (See: 3. 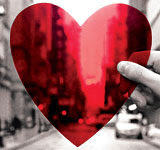 Because Robert Moses Would Have a Coronary If He Were to See Our Streets Now, By Justin Davidson Published Dec 14, 2008.) In this regard we should note that if Atlantic Yards were to happen as proposed, its design involves a strike against the public in that the developer would be taking over for his private benefit public streets, avenues and sidewalks. This cover story was where some people, including ourselves, were introduced to our first credible account of the Atlantic Yards tale. I was still responsible for legal affairs at the state finance authorities. We subscribe to New York magazine (basically since it was in its fledgling incarnation as part of the World Journal Tribune) but I had not read the story. It was brought to my attention in the office by other agency professionals. It was brought into my office noting that I would almost certainly find it a cause for alarm. Even then I did not read the story right away. When I did, I was quite concerned. It got may attention. I kept researching afterward. And there was lots worth researching. There is no better site for deep research on the subject than Atlantic Yards Report. The New York magazine piece was a wonderful initial introduction and overview. While there was some alarm on the part of professionals at the agency, there was another point of view available. From a technical standpoint the project seemed so harebrained that it could be predicted that it would never succeed. Harebrained, yes, but I think this pont of view could have been more of a protective denial mechanism against ever having to worry that, as a public servant, one might become responsible for something so publicly damaging. I, for one, suffered enormous angst and hoped that a new gubernatorial administration would come in with greater sense to put things on track. Thankfully, the project never came before the staff of the agencies before I left public service and we never had to deal with the project as public servants. One regret I had after the New York magazine article led me to become better informed was that I missed the opportunity to give our representative City Council Member David Yassky timely advice on the project. I remember being at a party one December long before the Public Authorities Control Board (PACB) and other approvals were in place. Councilman Yassky was earnestly looking for advice and reactions to the project. We discussed it with him briefly as a constituent and neighboring Brooklyn Heights resident. Unfortunately, all our information about the project up until then had come from the New York Times, which was inadequately reporting the reality of the project. The Times has still not caught up with its responsibilities and though it has occasionally run some good stories since it has a lot to make up for. It is not only a question of whether you report the news well, but when you report it well. The most important time for the Times to have been reporting well about the project was before initial approvals like the PACB’s were in place. It was also unfortunate that we assumed that other public servants who were working on Atlantic Yards were adequately performing their jobs. That was an incorrect assumption. As such, we did not sound the alarm with Mr. Yassky. We expressed some concerns about how bad sports arenas are for central city locations (cf. Madison Square Garden) and wondered about the exact location being picked for the arena, but mostly we missed the slew of issues that should have been brought up. The Times let us down and we, in turn, let down Mr. Yassky. Thank you, New York magazine for doing the job the Times did not do.- - Just a little too late. We have since that time been vigilant in keeping Yassky apprized of where he should be in terms of Atlantic Yards. 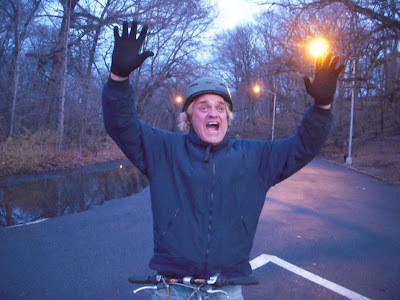 This Monday evening we had another conversion with David Yassky about Atlantic Yards when we ran into him. We told him that we want to do a Noticing New York interview with him on the subject of how people can make up for the fact that the City Council term limits extension vote is a net negative and setback in terms of properly ending Atlantic Yards. Yassky with his affirmative vote on the term limits extension is importantly among those responsible for this setback. (Our mention of an interview was actually a reminder because we had previously left a message with his office to this effect.) As it was, we began to discuss the subject right then and there. Yassky asked us why we thought the term limits vote was a problem for Atlantic Yards. We said because Bloomberg is a problem for Atlantic Yards. (We didn’t mention Marty Markowitz, who is less of an issue compared to Bloomberg.) Yassky suggested that Bloomberg had little to do with it. He suggested that Governor Paterson should be exercising his ability to pull the plug on the project. We disagreed that Bloomberg is not central to the problem. We pointed out that, if Bloomberg were not supporting the project the plug would already have been pulled. For instance, the project can’t go forward without housing subsidies. I noted that the state agencies (where I used to work), while they are state not city agencies, would never give subsidies to a project to which the mayor was opposed. The same is true about the Empire State Development Corporation (ESDC) the agency accountable to Paterson that can now easily pull the plug on Atlantic Yards. "I don't believe the project approved by the state is going to be going forward anytime soon," said Yassky. "Forest City Ratner should return the taxpayer dollars, and start talking about what actually can be built." We do not wholly second the Yassky thought. While we do think that "Forest City Ratner should return the taxpayer dollars,” we do not think it should be up to Forest City Ratner to be “talking about what actually can be built." It is up to our public officials to be talking about what should be built. The plug should be pulled. The project should be taken away from Forest City Ratner and a properly conceived and designed project that is actually bid out should be built by multiple developers, preferably, Forest City Ratner not among them. Atlantic Yards Report ran a story today about how Forest City Ratner is speaking in terms of its being entitled to build Atlantic Yards (and by definition being entitled to a decades-long 30+ acre monopoly on this section of Brooklyn). (See: Wednesday, December 24, 2008, Who's in control? 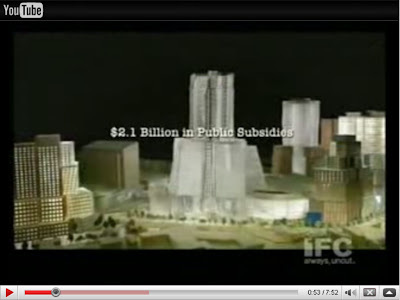 Forest City and the indirect subsidy value of its "entitlements.") Fact is, no one is proposing to build what was ever “approved,” there are no commitments from Ratner and there are no entitlements. (In fact, “entitlements” is a just a made up term. It stands for nothing legal and, at best, a claim upon politicians not the public.) The plug ought to be pulled now and the public funds should be retrieved just as Mr. Yassky says. Then perhaps Mr. Yassky can, as a candidate for City Comptroller, subsequently as City Comptroller Elect and then as City Comptroller start plugging those figures back into the city budget so they can be spent appropriately. 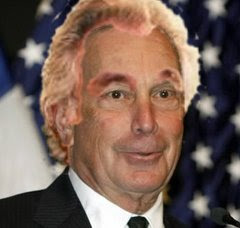 Michael Bloomberg must stand for reelection to a third term as mayor in 2009. Run, Mike, run. New York is only beginning to weather the damaging effects of the worst financial crisis to hit the U.S. since the Great Depression. New Yorkers deserve to select the person they feel is best qualified to pull the city through the crisis from among a full field of candidates. Bloomberg must be in the pack. The decisions that await New York, home of Wall Street, epicenter of the financial meltdown, will be extraordinarily tough, far tougher than anyone imagined just a few weeks ago. With the city's main economic engine headed for a sustained period of weakness, this mayor and his successor . . . . must have the know-how to draw businesses in rising new sectors that can pick up the slack in the coming decades. Put simply, Bloomberg knows what he's doing. . . . Politicians like Bloomberg work hard to promote myths so one needs to be especially conscious of the realities they would have you ignore. Mike Lupica in an excellent recent Daily News sports piece that looks at the how the Yankee Stadium financing scam* “will tell you everything about the way Bloomberg's New York actually works for the rich and the powerful” puts it exactly right: “As always with the current mayor, pay close attention to what he does, not what he says.” (See: It's a wonderful lie, Saturday, December 20th 2008) That’s good advice for dealing with our politician-mayor and, if followed, would probably also serve to keep you from losing money in a pyramid or Ponzi scheme like what Mr. Madoff was running. A particular reason for revisiting the Daily News’ endorsement for a Bloomberg third term is that it turns out that Daily News owner Chairman and Publisher Mort Zuckerman was among Madoff’s victims. (See: Madoff Scheme Kept Rippling Outward, Across Borders, by Diana B. Henriques, December 19, 2008 and Daily News Owner Mort Zuckerman Madoff Victim, By Chuck Bennett and Frank Rosario, December 15, 2008). His charitable trust is reported to have lost $30 million. It might not therefore be fair to say that Mr. Zuckerman put his trust in Mr. Madoff when he shouldn’t have. As he says, his $30 million was lost only because he trusted someone who in turn put his trust in Madoff. But how do these things work anyway? How close do most of us really get to knowing or considering everything we should know about underlying numbers and transactions? The fact is the way whole Madoff thing worked is that there were too many people around trusting Madoff and too many people around trusting those people who trusted Madoff. Yes, maybe by his account, Mr. Zuckerman was one step back in the trust chain but it is close enough to think about the issue of where he recommends we should put our trust. Why do certain people “trust” Bloomberg: Because there are a few too many people talking about how they trust him rather than paying close attention to what he does rather than says. fellow media titans—including Arthur Sulzberger of the Times, the Post's Rupert Murdoch, and the Daily News's Mort Zuckerman. How Trustworthy Was Daily News Conflicted Endorsement of Bloomberg? When Bloomberg ran for mayor in 2001 and the Daily News was the only paper to endorse him, he held more than a half-million dollars of stock in Boston Properties, the publicly traded real estate company that Zuckerman controls (Bloomberg may have actually owned more, but, by law, he was required only to disclose dollar amounts up to that ceiling). Bloomberg had to give up those holdings when he took office, prompted by an earlier COIB [Conflict of Interest Board] ruling, and the Bloomberg administration ended up doing its share of deals with Zuckerman's company—like air rights and other approvals on the company's 39-story tower at 250 West 55th Street. At an October 8 investors' conference, Boston's senior vice president Robert Selsam boasted of the company's success with City Planning, recounting how the firm had secured three complicated variances across five zoning districts that allowed it to maximize floors and footage. "The key," said Selsam, "is knowing how to effectively navigate the review and approval processes" of the city. He didn't, however, mention that he might have a bit of an edge at that game. But does Zuckerman’s personally having done business with Bloomberg qualify him to know that Bloomberg has the financial acumen to run the city? We say no and we think evidence of it is right in the language of the above-quoted Daily News editorial. 2. He has played an insiders’ game with both Wall Street and the big developers of the real estate industry. In both cases his deals short-change the public. 3. As a consummate crisis-insider he has failed to see the crisis coming or have appropriate perspective on its solutions. 4. He put all the city’s eggs in the Wall Street basket . . . And this is where we quote from the Daily News editorial: “this mayor and his successor . . . . must have the know-how to draw businesses in rising new sectors that can pick up the slack in the coming decades.” The fact is, the Mayor Bloomberg and his Doctoroff minions have had only scorn for anyone who tried to suggest cautious consideration of a future for the city that was not based nearly exclusively on the Wall Street economy. That scorn was because other sectors could not compete with the inflated values that Wall Street was generating. So, how different is what Wall Street in general did from the Madoff affair? Well, Mr. Madoff allegedly skipped a few steps, simply stealing his clients’ money rather than collecting big fees while exposing investors to risks they didn’t understand. . . . the end result was the same ..: the money managers got rich; the investors saw their money disappear. We’re talking about a lot of money here. . . . . — we’re talking about $400 billion a year in waste, fraud and abuse. Think of the way almost everyone important missed the warning signs of an impending crisis. How was that possible? . . . . The answer, I believe, is that there’s an innate tendency on the part of even the elite to idolize men who are making a lot of money, and assume that they know what they’re doing. The Daily News editorial told us to trust Bloomberg in these echoing words: “Put simply, Bloomberg knows what he's doing” . . . .
. . . . Yet, isn’t it time to check our assumptions about Bloomberg’s expertise and what he actually knows? In Bloomberg we must certainly have an almost perfect example of what Krugman means when he describes the tendency “to idolize men who are making a lot of money, and assume that they know what they’re doing.” Bloomberg put his faith in the inflated values of the nontransparent Wall Street financial system. He was selling those inflated values to the city without an end game or exit strategy. Personally, as a participant higher up the chain Bloomberg may have done well, but with his clubby deals benefitting insiders at the expense of the public, how much is Bloomberg to be trusted? Mr. Zuckermen lost $30 million to Mr. Madoff. He may or may not have put his faith directly in Madoff, but when he recommends that we put our faith in Bloomberg does he recommend an individual who is really that much more deserving of our trust or capable of delivering a substantially different result? 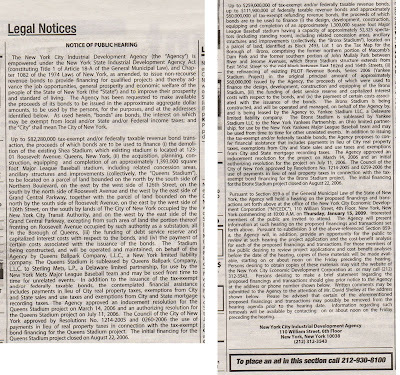 Hey, everybody, listen up: A legal notice has appeared that a hearing may or may not be held come January 15, 2009 on the highly controversial proposed issuance of additional tax-exempt bonds to give more money to the Yankees and the Mets for their new stadiums. It may be (if a hearing is held on January 15th) that the bonds would be in the respective amounts of $370.9 million for the Bronx stadium and $82.28 million for the Queens stadium (or $453.18 million combined, which is not to mention an additional $60 million in refunding bonds). Specifically, the legal notice that appeared in the New York Post on December 16, 2008 says that if you happen to remember to call a certain telephone number “on or about noon on the Friday preceding the hearing,” that someone (who is not answering that telephone number presently) will give you notice whether or not a hearing will be held. Humm, the “noon on the Friday preceding the hearing”: If the hearing is Thursday the fifteenth we think we are then supposed to figure that means the Friday we are supposed to keep in mind on which to make our phone call would be Friday, January 9, 2009 (less than six days before the possible start of the hearing). We are scheduled to be busy at noon that day, before and after noon as well. What do we suppose the specification to call “on or about noon” means? What if we do not call within an hour of that time? Two hours? Of course, you only know to make this phone call (if you can remember to) if you were lucky enough to spot the telephone instructions in the notice that appeared, or if someone like us is telling you about it. We, ourselves, got the information via Good Jobs New York. So where are we? We have a notice that 1.) notice will be given if 2.) a phone call is made (at the right time) to request that notice. If you don’t call, no notice. 3. The agency must give at least thirty days published notice of said public hearing and shall, at the same time, provide notice of such hearing to the chief executive officer of each affected tax jurisdiction within which the project is located. The notice of hearing must state the time and place of the hearing, contain a general, functional description of the project, describe the prospective location of the project, identify the initial owner, operator or manager of the project and generally describe the financial assistance contemplated by the agency with respect to the project, and provide an opportunity for the public to review the project application, which shall include an analysis of the costs and benefits of the proposed project. “The agency must give at least thirty days published notice of said public hearing”? Until just recently, the law required “ten days published notice.” It seems the legislature wanted the longer thirty-day period of notice. Does an offer to inform inquiring public whether or not there will be a hearing less than six days (including a weekend) before the hearing starts, comply with the directive to give at least thirty days notice of the hearing? Probably not. Among other things, it is less notice than was probably given under the old ten-day statute! And Where Are The Dawdling Applications and Cost Benefit Analyses the Legislature Wanted? - - Forcing the public to deal on a rushed basis with something that is purposely held up and sprung at the last minute is just a scam strategy to debilitate public response and its ability to appropriately raise issues. Remember the way that Bloomberg held back his scheme to extend term limits so he could pursue a third term? In early summer he knew he planned to go after the term limit extension (well before the fiscal crisis), but then he waited to push it through the City Council in a last minute October rush! There really can’t be argument then that this hearing indeed sounds like the way that Bloomberg and his execs prefer to do business. And we know that the gift of cheap bucks for the wealthy stadium owners is something that Bloomberg wants. But, do you think that the legislature wanted rush-through hearings with no substantive public evaluation of the applications and the public benefit analysis? 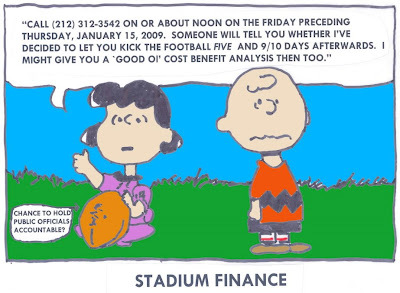 Bloomberg has also been trying to misrepresent so as to minimize the true costs to the city of issuing the tax-exempt R-TIFC-PILOT bonds to finance the stadiums. “R-TIFC-PILOT” or “Return Total Intercepted For Costs-PILOT” agreement involves a PILOT (“Payment In Lieu Of Taxes”) agreement that is unlike a typical PILOT agreement, which provides for specified payments to be made into city coffers just like taxes. R-TIFC-PILOTs (the nomenclature we offer in contradistinction is pronounced “Artifice-PILOT”) provide that the payments that would have been paid like taxes will instead be intercepted and used as a gift to relieve a developer/stadium owner of responsibility for costs that would normally be the owner’s. In other words, the public picks up the private tab. Bloomberg likes to disregard this public expense. For some of what we have written on the mayor’s unwillingness to properly acknowledge the substantial cost of the stadiums see: Who Gets Clipped? Bloomberg Radio Clip on Stadium Financing (Wednesday, December 17, 2008) and Stadium Finance: Mayor, Professing to Know Numbers, Should Know He Can’t Have It Both Ways (Unless He’s Keeping Two Sets of Books) (Monday, December 15, 2008). Returning to a point we made earlier, what about the whereabout of those project applications with the cost benefit analyses? Wouldn’t you think that the city agency would now have in hand what they plan to give to the public? Would the city have run anything in the newspapers if the applications and cost benefit analyses were an just a yet-to-be-received unknown? Highly doubtful! If the applications and cost benefit analyses are already in city agency hands, why doesn’t the city want to make the applications and cost benefits available to the public now? The Possible Hearings? How Possible They Won’t Be? There are still hundreds of e-mails connected to the stadium assessment the city refuses to release. That's why it's time for some prosecutor to step in, subpoena every document and figure out if the Bloomberg administration manipulated land assessments for the Yankees. That Daily News article was published on the very same day that the notice of possible notice appeared, but after that notice had already been sent in to the Post for publication. (By the way, we note that the issuance of these bonds is of state-wide concern but, consistent with keeping things on the Q.T., the notice-notice was in the NYC Post rather than edition of the New York Times that receives state-wide circulation.) The Daily News article asks whether city officials violated “state law, which requires uniform valuation methods for all properties?” There is also the question of whether there was perjury before Rep. Dennis Kucinich’s Congressional subcommittee investigating the matter. As things heat up, do you think the city will still be desirous of holding the hearing when the sixth day before the January 15th arrives? Given the mention of criminal proceedings, we wonder, and maybe you do too, whether the city officials who were involved in this affair have started to think about hiring private personal counsel to represent them in any prosecutorial proceedings such as those called for by the Daily News article. It seems a good time to offer some seasonal thoughts. Who’s a jolly good fellow and a wonderfully apt personage to run into in the dusk of a Prospect Park evening at this time of year? I’ll give you a hint: He’s especially busy this time of year, from the end of the Macy’s Thanksgiving parade to right up to Christmas; And he has his roots in religion and cheerily encourages us to aspire to a better life. . . .
. . . Did you guess? Quotes from the film What Would Jesus Buy? When we caught up with the Reverend he was on a bicycle, not in his signature white suit, and his famous golden pompadour was hidden under a sensibly safe bike helmet. We did a lap with Billy and talked. Among other things, the Reverend has been involved in important fights against over-scale and over-commercialized development that destroy this city and other communities. He is part of the community opposition to the proposals for Coney Island’s death-by-redevelopment and we caught sight of him at the May rally calling for a “time out” on the Atlantic Yards megadevelopment’s blight-inducing demolition of Brooklyn neighborhoods (Saturday, May 03, 2008, Not a done deal: “Time Out” rally met with “Build It Now” counter-protest). This past summer the Reverend and his lovely wife, Savitri D., officiated at the Coney Island Mermaid Parade as King Neptune and Queen Mermaid. Reverend Billy has also been involved opposing the effort to “privatize” part of Union Square by putting a Danny Meyer restaurant in the Union Square Pavilion at the north end of the park. During our chat Billy took a call about an upcoming interview he will be doing with a Texas radio program and he talked about appropriate music. His web site has downloadable songs, sung by his Stop Shopping Gospel Choir and the Not Buying It Band! One of those songs is an energetic anti-development song, “Push Back,” which has lines like “this town ain’t no super-mall.” The song has different verses about different development issues. (An on-line music video of “Push Back” is also available.) Reverend Billy even has a new television series. We asked Billy whether “Push Back” had a verse about the Rudin/St. Vincent’s real estate deal where part of the Greenwich Village Historic District is proposed to be sold off for a big dense project for the purpose of putting a lot of money in the developing entities’ pockets. It was on our mind because the Landmarks Preservation Commission had another meeting on it this week. (The LPC was having a lot of problems with the proposed design because a big, dense project looks rather, well. . big and dense.) No, said the Reverend, the song doesn’t mention Rudin/St. Vincent’s; he said it may be time to write some new verses to add to the song. So watch for possible updates. WARNING: Stop Shopping Gospel Music has been known to induce fits of subversive singing inside subway cars, bus shelters, automobile interiors and food co-op shopping aisles. 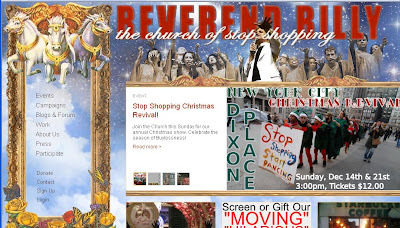 You can catch Reverend Billy this Sunday. (See his events page.) But you’ll have a conflict if you were looking forward to another seasonal event with music. 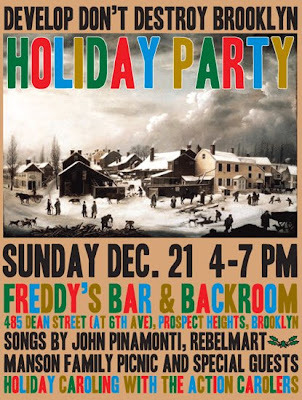 Sunday is also the Develop Don’t Destroy’s Annual Holiday Party at Feddy’s Bar, now a long-standing tradition. 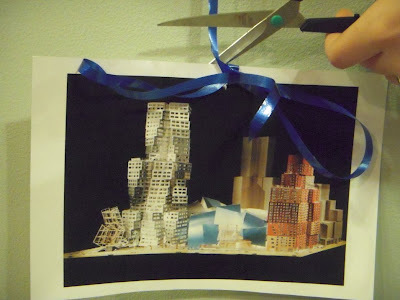 (If Forest City Ratner doesn’t give up the ghost on Atlantic Yards-- that would be the Ghost of a Pataki Christmas Gift Past-- the tradition could go on for decades.) Our favorite carol of the DDDB evening is “Silver Bails” playing on Assembly Leader Sheldon Silver’s inappropriate approval of AY. ‘Tis the season to be jolly.- A happy, merry and musically complete holiday season to all. Following up another of our very recent posts (Monday, December 15, 2008, Stadium Finance: Mayor, Professing to Know Numbers, Should Know He Can’t Have It Both Ways (Unless He’s Keeping Two Sets of Books)) we want to take issue with a recent quote from Mayor Bloomberg advocating that the city issue more tax-exempt bonds (another $370 million) for the new Yankee Stadium. He tries to sell the bond sale by promoting the notion that the expenses all just wind up on the federal governments tab. 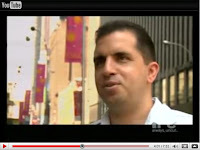 Here, courtesy of radio station WNYC, is the clip the station ran as part of its local news this past Friday (12/12). WNYC NEWS READER: Mayor Bloomberg says the city should issue another 370-million dollars in tax-exempt bonds for the New York Yankees. The tax-free bonds are cheaper for the team...because investors don't have to pay taxes. And since federal tax rates are higher than the city's...Bloomberg says it’s really Washington that will be subsidizing the new bonds. BLOOMBERG : (in audio clip) It's a trivial amount of money and it's basically federal money or forgone interest taxable income. WNYC NEWS READER: A spokesman for the city's Industrial Development Agency...says the city would lose about 16-million dollars...because the bonds are tax-exempt. But the Yankees have agreed to pitch in about 11-million...and there would be other benefits...so that the city would more than break even. The extra bonds would allow the team to add extra features to its new stadium...which is supposed to open in April. The Yankees will pay back the bonds...but won't pay rent or property taxes. 1. As we analyzed in our previous post linked above, the expense is not just on the Fed’s tab. The bulk of the expense, 85%, is paid for by the city. In the case of the extra $370 million in bonds, it should be considered that the entire amount, and then some, is the expense the city will bear. the practice of providing taxpayer subsidies to the building of sports stadiums is a transfer of wealth from the many taxpayers to the few wealthy owners. 3. Also, as covered in our previous post, it is far from clear that even the previous bonds issued to finance the new Yankee Stadium are legitimately tax-exempt. The exemption is in jeopardy because of collusive activity on the part of city officials when they established the real estate tax assessment figures upon which the exemption of the bonds is founded. It is quite possible that bonds already issued, plus any of the proposed additional stadium bonds issued, will retroactively be declared taxable. If that happens the city will be liable for substantial additional attendant expenses the mayor is not mentioning. 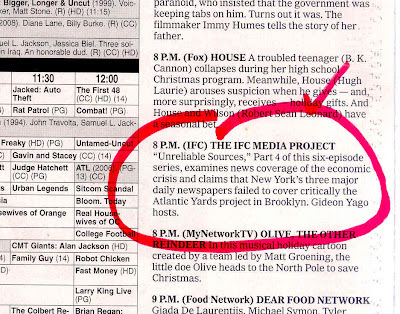 The IFC Media Project recently broadcast segment, Unreliable Sources, reported how, in a failure to serve the public interest, the major news story of the proposed Atlantic Yards megadevelopment has gone only “half-told” by New York’s three major dailies because of “government collusion with the developer and the developer's business ties.” The developer, (Forest City Ratner) business ties are to the New York Times. We were amused to see that the segment about the lack of critical coverage was recommended viewing on the Times TV page (see image above). 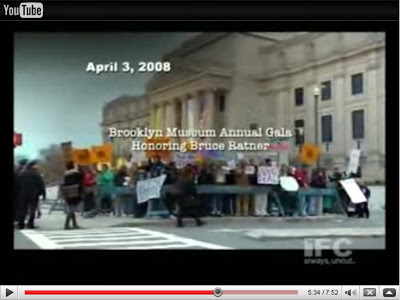 Speaking of letters, we were pleased to see that the April 3, 2008 demonstration at the Brooklyn Museum protesting its highly inappropriate “honoring” of Bruce Ratner formed an important backdrop for part of the IFC piece. (For more on this see: Friday, April 04, 2008, "Shame!" Crowd outside museum shouts "Ratner's bad for Brooklyn") We note that you can find a letter on line from concerned members of the community that explains just how inappropriate it was for the Brooklyn Museum to honor Ratner and why that demonstration was held. We were, of course, a part of it. We are pleased that the IFC documentary served as a reminder to keep the question of the museum’s conduct in the public consciousness. The museum has yet to issue a suitable apology. The anniversary of the demonstration is coming up, so who knows, maybe a commemorating anniversary demonstration would be in order. We Wrote The Times About. . .
For more of what we have written on the subject of density and scale we recommend: Weighing Scale (Friday, September 26, 2008) and Jane Jacobs Atlantic Yards Report Card #4: Appropriate Density? NO (Saturday, November 29, 2008). We should also note that we separately approached the Times about addressing whether much of New York may be becoming too dense. The Times did not run the exact op-ed style piece we suggested but (coincidentally?) they subsequently ran a story consistent with our suggestion about whether increased density is going to overburden Bryant Park. It was a valuable article but its tone was dangerously close to one people may dismiss as “fluff.” Our complete story about what we sent the Times is at: Is NYC Becoming Too Dense? Who’s to Say? (Thursday, December 11, 2008). Please consider writing your own letters to the Times and feel free to crib as much as you like from anything we have written. You might first want to watch the IFC Media Project’s Unreliable Sources segment. It is available on YouTube, see the No Land Grab link. Remember, the Times TV page said it is recommended viewing! Re: Is the 1200 Pound Gorilla the Elephant in the News Room? Welcome to New York. If you haven’t already done so, I suggest that you put on your list of new-to-the-city things-to-do, taking a visit to Battery Park City. Have a meal or drinks and take in the harbor at one of the waterside restaurants. Then I suggest that you take a tour which you combine with the following homework. Wander through the streets of Battery Park City and look up at the buildings.- - Ask yourself this question: Is Battery Park City too dense, not dense enough or just about right? I think the answer is that the density is just about right, though the answer that suggests itself as you experience the streets might change with the development’s final build-out, just as it has shifted somewhat over the years of its construction since I graduated from urban planning school. If the experience is that the density of the development is “just about right” this is in no small degree a matter of Battery Park City’s excellent design, that it sits on the water, and that it has fabulously conceived open spaces, some of them sweeping and all of them superbly thought through. The development even has rooftop heliostats to redirect sunlight to shadowed plazas! Now ask the question, if this is the right density for such a project under these excellent conditions, then what about the phenomenally greater density proposed for the Atlantic Yards project? Not only is Atlantic Yards proposed to be the most dense area of the United States, but it is poorly designed. Further, as a lawyer who has only just left government service, I feel ashamed and associationally tarred by the disregard for proper process and fundamental fairness that is bringing it about. 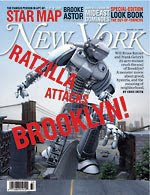 I invite you to visit the web site “Atlantic Yards Report” and to watch Isabel Hill’s 2007 documentary “Brooklyn Matters.” Even if you were to quibble in any way about details in either one, you cannot disagree that each is an example of excellent journalism. Central to the unfolding story to be told is the theme of politicians acting out of character with their promises and advertised personas and how it may all come home to roost. Some day a great book will likely be written about what happened in the center Brooklyn, particularly if anything like the monstrosity proposed ultimately materializes and affects generations. The New York Times will be mentioned but, as things stands now, every last footnote mentioning the Times will be about how the Times did not adequately cover this story. No doubt analogies will be offered with regard to the Time’s other recent failures of coverage while mention will have to be made of the possible influence of the business relationship between the Times and Atlantic Yards’ oddly selected developer. There is still time to start covering a major story.- Obviously, there is also an obligation to the public to do so. Rich Calder, interviewed in the IFC piece, complained about a lack of access to information. I think that Mr. Calder was referring in part to the fact that the public agencies responsible for Atlantic Yards are not supplying the public with information to facilitate knowledge of what the actual costs likely are. The developer, Forest City Ratner, fuzzes up the numbers to the best of its ability and the public agencies are more or less complicit. Norman Oder of Atlantic Yards Report advocates that when a news story and numbers aren’t handed to you, reporters need to go out and get them: The IFC Media Project scoop: former Daily News reporter says she was pulled off AY beat (and source blames Ratner), Tuesday, December 09, 2008. As a mayor who professes special financial expertise and an understanding of finance and the way numbers work, Michael Bloomberg should know that when it comes to stadium and arena finance he can’t have it both ways. 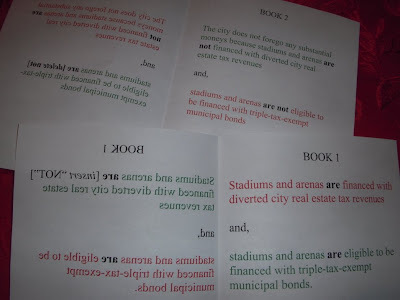 The whole premise for why bonds issued to finance sports stadiums or arenas can be tax-exempt is that the revenues used to support and pay the bonds are diverted city real estate tax revenues, intercepted before they go into city coffers. In other words, those diverted revenues pay for the stadium/arena bonds rather than being used for anything else for which the city might use sorely needed tax revenues. 2.) The city does not forego any substantial moneys because stadiums and arenas are not financed with diverted city real estate tax revenues and, accordingly, the stadiums and arenas are not eligible to be financed with triple-tax-exempt municipal bonds. Last Friday, (12/12), on the Live from City Hall with Mayor Mike and John Gambling radio show, Bloomberg was trying to have it both ways. He was disingenuously trying to sell the public on the idea that 1.) no substantial city tax revenues are being diverted to pay the bonds and 2.) that the bonds will still be tax-exempt. It's not city money, other than we would forego the taxes- (Gambling interjects the "revenues") a little bit of revenue, it's a. . .if you do the calculations, it's a very small amount of revenue,- on the interest on those bonds. In other words, Bloomberg is attempting to represent that bonds will be tax-exempt and that the only revenue the city will be forgoing is income tax revenue that won’t be paid on the bonds. He entirely ignores that diverting the city real estate taxes is the essential foundation and prerequisite for the bonds to be tax-exempt. The diverted real estate taxes are, in fact, the bulk of the tax revenues that will not be collected by the public. For instance, looking to Atlantic Yards arena calculations for some representative figures, when tax-exempt bonds are issued, 84% of the forgone tax revenue would be real estate taxes the city is not collecting. In other words, in terms of foregone tax revenues associated with issuing the tax-exempt bonds, the city is bearing 85% of the burden (84.33% + .68%). These are just the subsidies related to issuing the tax-exempt bonds. In bigger picture terms, the Atlantic Yards arena is getting other public subsides: the MTA and the city are both giving land at below market value and sales tax won’t be collected. There are similar additional subsidies to consider in the case of the Yankee and Mets stadiums. If we are right, the city, with all its shenanigans, will have earned itself substantial potential liability and the dubious distinction of upsetting the tax-exempt bond-buying market with bonds becoming taxable. No doubt Mayor Bloomberg will assert that we are wrong and that the bonds are tax-exempt because taxes are actually collectable on the Yankee Stadium property. But once again, Bloomberg can’t have it both ways; either taxes are collectable on the Yankee Stadium property and the city is forgoing them, or there aren’t collectible taxes on the property, in which case the bonds are taxable. Congressman, the private payments are the taxes they owe. It’s as though you built an extension on the house and you said to the taxing authority: send my payments to the bank to pay off the mortgage. The notion that this is being paid for by the Yankees is delusional. The setup is basically like paying taxes on your home and then having the government use that money to help you pay off your mortgage. Now does Bloomberg want to argue that these ‘synthetic taxes” are just fictional and would never be owed in the first place? Could it somehow be OK to make believe high taxes would be owed on Yankee Stadium because none of the imaginary taxes would ever be paid? Is there supposed to be some kind of notion that we just don’t charge taxes on big projects? Where then is the tax exemption for the bonds coming from? It should be noted that the Bloomberg quote from the John Gambling show to the effect that “if you do the calculations, it's a very small amount of revenue” that the city is forgoing, comes from a longer segment of the interview about the Yankee and Mets stadium bonds. In that discussion Bloomberg misrepresented other aspects of the tax-exempt financing for the bonds. Norman Oder wrote about it in Atlantic Yards Report, pointing out some of Bloomberg’s mistakes and contradictions: Bloomberg: "Letting any group have a special deal is not what democracy is about," Saturday, December 13, 2008. Why does the federal government have a program? It stimulates construction jobs and economic activity. They might not do these things, build stadiums, or in this case some infrastructure around it, if it costs them more. The economics might not work.
. . . .we'll get less income from taxing the interest that the bondholders would pay, but in return there's more construction, more jobs, and that's good for society. Stadiums and Arenas Don’t Provide Benefit. . .
A Cynical Ploy? The Good of the Few Outweighs the Good of the Many Taxpayers? Bloomberg, Professed Financial Expert, Getting It Wrong Because . . . The Atlantic Yards Report article on the Gambling interview (which is much shorter than this article) efficiently points out two other things of pertinence respecting the overspending of public monies on the stadiums. First, in the interview, Mayor Bloomberg was able to talk at some length about how the MTA is short of both operating and capital budget funds without noting that a substantial portion of the gap of several hundred million dollars would be closed if the MTA were not selling its Vanderbilt Yard property to the Atlantic Yards developer for substantially less than the property’s market value. The bottom line is that the state should collect the taxes. It is money we need, number one. Number two, letting any group have a special deal is not what democracy is about. It breeds contempt for our laws. The only problem is that Bloomberg, having shifted gears, was now no longer talking about the stadium owners with whom he has struck deals to let them intercept, uncollected, all their “tax payments” to cover their private sports business expenses. Instead he was talking about New York State collecting cigarette taxes from Native Americans. (Bloomberg also spoke derisively about possible hard feelings that might exist concerning the acquisition of New York’s land from the original native population. )- Did we happen to mention that Mayor Bloomberg likes to have it both ways?- - Yes, that’s where we began. . .
JOHN GAMBLING: Speaking of things that are expensive, I'm reading that our stadiums, our baseball stadiums are getting more and more expensive, and they've looked for more money or the right to bonds, to rent. . loan bonds or let (Gambling probably meant to say “get the benefit of borrowing from an issuance of”) bonds . . . . So everybody says, look, we'll get less income from taxing the interest that the bondholders would pay, but in return there's more construction, more jobs, and that's good for society. It's not city money, other than we would forego the taxes- (Gambling interjects the “revenues”) a little bit of revenue, it’s a. . .if you do the calculations, it’s a very small amount of revenue,- on the interest on those bonds. So would the state, so would the federal government. But our development bank is set up to do this, and you do it for big projects, and the federal governments [sic] approve these projects, and we'll go on with them. Is NYC Becoming Too Dense? Who’s to Say?